Derrek discusses crankbaits with SPRO pro staffer B.A.S.S. Elite Series angler John Crews. SPRO Pro and Bassmaster Elite Series Angler John Crews. Known for his crankbait skills Bassmaster Elite Series angler John Crews and SPRO USA have developed a superior comprehensive line of crankbaits. I had the chance to speak with John, not only about these outstanding lures but how to better utilize them as well. With the post-spawn season past us and summer fast approaching, what better time to 'Catch' what John Crews has to say about crankbait angling. BBZ swimbait fans have known, for a long time, that an angler can twitch slack line and make a SPRO BBZ trout style swimbait perform a 180 degree directional change. But did you know that you can accomplish the same thing with a SPRO Little John DD crank bait? You can reel this crankbait down, pause and with slack line and based on the resting position of this lure, when popped it will run forward and then complete an entire U-Turn, wow! Crews explains that this unique crankbait attribute has triggered countless strikes and subsequent catches for him. This should give anglers something to think about when cranking past key cover and structure elements. There is so much more to crankbait fishing than just 'chucking and winding'. Long before the recent trend of many manufactures to re-introduce crankbaits that feature 'evasive hunting' action during retrieval, John Crews had previously developed the Fat John 60. Slightly longer and twice as wide as the original Little John this bait features a computer chipboard bill set at an unique angle that produces a square bill action. Crews describes the Fat John 60 as a 'power' crankbait well suited for heavier cover and stronger test fishing lines. When retrieved at medium pace it will track in a unique side to side rollover free darting action. Unlike a crankbait which tracts in a straight line back to the angler, Crews describes this lures action as being alive. Baby Fat John 50 runs 1 to 2 feet, left - Citrus Nasty / top right Chartreuse Black Lighting / bottom right - Honey Shad, Crews will use this lure in any shallow water application, clear or stained but he loves this lure in off-colored water. There are a tremendous amount of crankbaits that feature some type of rattling component. Most of them have a distinct sound produced by ball bearings located within the bait's hollow plastic body. While fishing with both rattling and non-rattling cranks, Crews has always produced a higher catch rate with non-rattling types. Crews says a crankbait's vibrating action is far more important than a bait's rattle. When it comes to crankbaits it's the lure's vibration which fish don't become conditioned to that appeals to their predatory instincts and not the rattles. Crews explains that your rattling lure may have the right vibration for the current conditions but if a bass has already been caught on a rattling bait it will tend to shy away from it. Subsequently the SPRO Fat John line is silent and the SPRO Little John series feature a unique soft tungsten ball weight transfer system. Crews feels these attributes make a tremendous difference on pressured bass that have been condition to rattling lures. Fat John 60 runs 1 to 3 feet, left - Nasty Shad / top right - Clear Chartreuse / bottom right - Chartreuse Black Back, this lure shines at Rip Rap locations and during the shad spawn. Crankbait fishing is often considered as a "power" technique. Devoted BBZ anglers know that power is finesse and finesse is power. John Crews demonstrates this thought by fishing his crankbaits on lighter fishing line than most anglers. He will be the first to tell you that you need to be realistic about the aquatic environment you're fishing but says most anglers hinder their crankbait presentations with too heavy pound test fishing line. Crews feels the lighter line adds much more to the action of a crankbait and that landing larger bass on lighter line is not an issue. The lighter line with a thinner diameter provides for longer casts, less spooked fish, deeper dives and more pronounced deflections when the lure hits an object. He advises that if you want to expand your crankbait talent then start fishing with the lightest line possible. Crews says these adjustments will result in more bites and more caught fish. Little John 50 runs 3 to 5 feet, left - Cell Mate / top right - Watermelon Red Craw / bottom right - Blood Craw, Crews loves this lure during pre-spawn conditions and when water temperatures are in the low 50 degrees. He used the Blood Craw pattern to start his 2010 BASS California Delta victory. The SPRO John Crews signature series crankbait line will cover all portions of most water columns. With the exception of the spawn and immediate post spawn periods, crankbaits are Crews favorite search tool for the remainder of the year. Across the country bass have a relatively wide forage base, bream, shad, blue-black herring, hitch the list goes on, these prey items are on the menu and crankbaits do an exceptional job of mimicking them. By using size, profile and pattern, crankbaits do a great job of 'matching the hatch'. Some crankbaits produce a hard tracking retrieve action emulating an injured or a frantic out of place prey item. 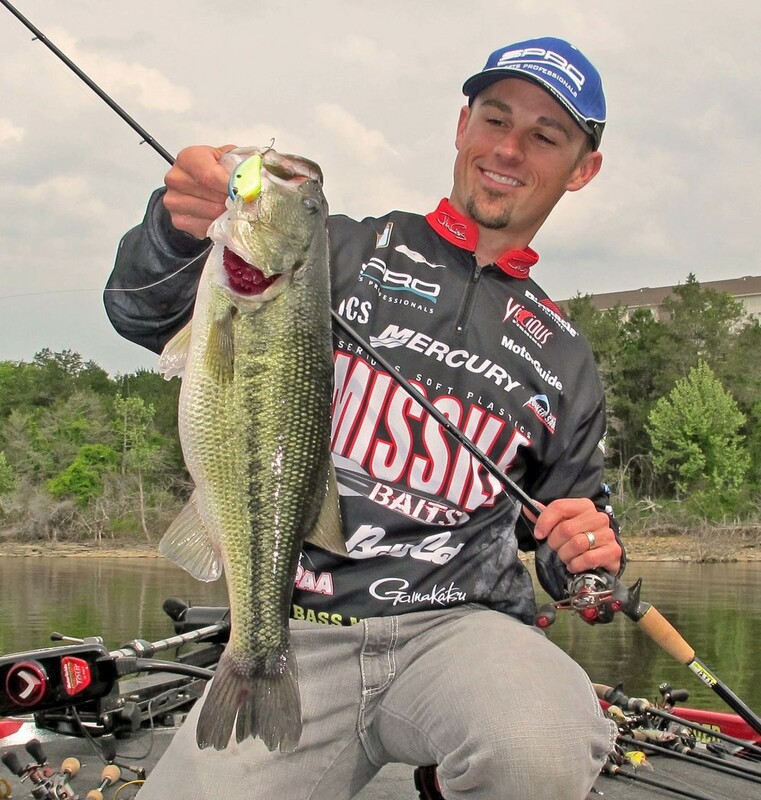 Territorial bass is another seldom mentioned characteristic of crankbait fishing, says Crews. He has observed that bass often simply don't want other creatures stomping through their turf and will strike aggressively in an attempt to punish these trespasser's. These are a few of the aspects that make crankbaits a search tool favorite for Crews. Little John MD 50 runs to 9 feet, left - Spooky Nasty / top right - Chrome Olive / bottom right - Spooky Shad, Crews will present this crank when he finds lay downs and brush located next to a drop off location with the top of the brush in the 7 foot deep range. The bait comes through brush well, allows you to deflect and with its slow rising float provides an effective pause in the strike zone! Crews remind us that the entire lure delivery system, rod, reel, line and lure must balance and compliment one and another. Knowing each of these components is important and if one or more elements do not match well, you are cheating your effectiveness. One of the most important components in your system is your fishing line. Crews advices anglers to select one line manufacturer and stay with it. The consistency from one product line will allow an angler to learn exactly what you can or cannot do with it. There are a lot of good line manufactures out there, says Crews who uses Vicious fishing line. By settling on one brand you will learn exactly how demanding you can be with each pound test line. Knowing just how hard you can pull and push the limits will result in landing more fish with less break offs. Crews explains, this will be extremely critical with a trophy catch in and around heavy cover elements. Crews says if you learn only one thing from this crankbait discussion it is to learn the limits of each pound test within the same manufacture's product line. Little John Baby DD 60 runs 10 to 14 feet, left - Chartreuse Blue / right - Citrus Shad, this is a great crankbait just after the post spawn as bass start to move onto deeper ledges in the 8' to 12' depth range. When it comes to success, one of life's lessons is that simple things can add up to make a tremendous difference. It may sound so straight forward and commonplace to say your hooks need to be sharp. Nevertheless, John Crews, an angler who relies on his hooks to provide a living, knows that it's critical to keep in mind the small things like when a hook needs to be replaced, this seems obvious but for Crews this lesson comes from the school of hard knocks. Crews will change out hooks three to four times within a single tournament day. He recalls a critical day of competition where after catching about nine or ten fish he then started losing fish after fish. After realizing something had changed but not knowing exactly what it was he had several thoughts. He wondered if the fish were now taking the bait differently, or had their color preference changed and did their level of aggression change. One thing was for sure, after losing five of his next six bites, something was wrong. Crews finally inspected the treble hooks and discovered they had become dull from previous catches and deflections during retrieves. After changing those hooks he went right back to catching bass on the very same stretch of water, he learned that those lost bass were biting fine but the dull hooks were just not penetrating. Crews hook of choice is a Gamakatsu, he has been using them throughout his life. Whichever hook brand you choose, Crews can't stress enough that you have to check your hooks frequently and be equipped to change them often. Like life, tournament angling can surprise you with many unexpected challenges, so take control of what is within your power. Little John DD 70 runs to 20 feet, left - Cell Mate / right - Chartreuse Blue, excellent for summer cranking, especially at reservoir lakes. Producing multiple top 10 finishes during May and June this is one of Crews favorite search baits, it's hard for him to put it down. When it comes to crankbaits, anglers have a mind boggling amount of choices. As you evaluate what each one is comprised of and compare them to each other you discover that crankbaits currently on the market are far from equal. Available in a multitude of color patterns the SPRO/Crew's crankbait line has distinct advantages. They feature superior Gamakatsu hooks ready to fish straight out of the packaging. Their flat sided design produces a unique vibration and pivoting swimming action in comparison to the roll that round sided crankbaits typically to have. The lessons learned in competitive bass tournaments, just like great crankbait angling, transcend all fishing practices. Thank you John Crews for sharing your endless knowledge and insight into your specialties. The time you gave to the readers at the BBZ is greatly appreciated and all of us wish you continued success on and off the water!